Written by Sophie Jaggs from Likeable Lab. The Marketing Manager of Mt Ruapehu. Broken Shed Vodka. And the spectacular Tauranga Art Gallery. How can you go wrong with that combo? From the get go, we were wowed with passionate Kiwis who love their work. All kudos to Broken Shed Vodka who started their venture in a broken shed (funnily enough) on the Wanaka waterfront. They’re now a sought after drinks company worldwide, dominating in the States. And if you’re wondering, the vodka paired with ginger ale was eye-widening good. Then we got to meet Matt McIvor, the lucky guy who gets to work in one of the coolest industries in the world (excuse the pun). Heading up the marketing team at Mt Ruapehu, Matt captured us with his passion for what he does and told us some absolute gems to go away with. Read on to find out how Matt and his team use social media to create a hugely successful following. Then learn about their successful rebrand. Be real and genuine. For Mt Ruapehu, it’s important their content comes across as if you’re talking to a lifty as you get on a ski lift. Have a tone and be consistent. You can have different content topics, but try to keep a constant tone. For Mt Ruapehu they use the topics dream, updates, deals and info. Be prepared. Yes it’s good to plan your posts, but expect change and be adaptable when it comes down to content. You can miss out on gold opportunities if you’re relying on planned posts only. Test your times. Mt Ruapehu found Wednesday and Thursday nights were their most successful time to post. Test your audiences. Try out a few different demographics and see which one works well for which piece of content. Captions. Try to cut out words, be fun and punchy, and let the image speak for itself. Share stories. Mt Ruapehu sell products through sharing stories. Instead of the hardsell ‘buy this now!’, they tell a story that allows the customer to engage and want the story for themselves. Videos. Capture your customers attention in the first 5 seconds and don’t let the video go past 90 seconds. And live video rules, its shows how genuine and honest the brand is! It gets a massive amount of reach and big bang for buck. Where and what to post. Mt Ruapehu post on Facebook daily in winter, and only high quality images make it to Instagram. They use Instagram Story daily (in winter) and are big on Facebook Messenger and comments, making sure they keep on top of answering people quickly. Quality over quantity. 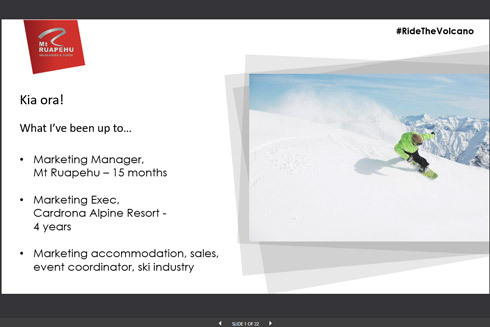 Mt Ruapehu use their Facebook drafts to create content, sit on it and make sure they review it before it goes live. If it’s not up to standard, it doesn’t go. If you didn’t know, Mt Ruapehu just went through a successful rebrand. And, according to Matt, this is how (and why) they did it. They had a clear reason why it was needed. By separating out Whakapapa and Turoa ski fields they were able to strengthen the following and educate people about the two separate fields and what they have to offer. They wanted to breath fresh air into the brand and boost staff morale and give them something to be proud of. In the process of the rebrand they continually consulted staff and tested concepts on them. A great way to get staff buy in. A big competitor analysis was done and focused on who their customers were. I think everyone left with a warm fuzzy feeling. People like Matt who are clearly pumped about what they do are infectious. And with proven marketing strategies that are working, we have no choice but to take on Matt’s wise words. A big thanks to you Matt for making the trip up to see us, especially in the middle of your silly season. PS: Thanks to the art gallery for hosting us. They have some great events coming up. Check out their website. Fill in your details and we’ll keep you up to date with our latest marketing news and events.